It’s time to leave the spring classics behind us for another year, and turn our attention instead to the major one-week stage races in the run up to the summer’s Grand Tours. First up is the Tour of Romandie, named after the French-speaking Romandie region of Switzerland in which it has been raced since 1947. It follows a ‘mini’ Grand Tour format, with all disciplines covered: there are two individual times trials, two summit finishes, and two sprint stages. Given this format, those G.C. riders not targeting the Giro but looking ahead to the Tour see this as a major checkpoint in their training for July, and, in recent years, we have seen the winner in Romandie go on to win the Tour, such as Cadel Evans in 2011, Bradley Wiggins in 2012, and Chris Froome in 2013. The tour kicks off with a short prologue, before stage one gives the sprinters their first chance to shine. Stages 2 and 4 are for the climbers, with the mountains broken up by stage 3’s time trial. The tour is rounded off by a second chance for the sprinters. There is an extremely strong G.C. field this year, with really only Contador and Aru missing from the list of big names. Here’s a round up of those in with a shot at the overall podium. Romain Bardet is having a great season so far, with strong performances at the Tour of Oman, Paris-Nice, Catalunya, and Trentino. The two time trials don’t favour his skill set, but he can hopefully make up for that in the climbs and descents. The Richie Porte/Tejay Van Garderen BMC double act went well in Cataluyna, with a 4th and 5th finish for them respectively. They’re recently back from an altitude training camp, so let’s see if that is put to good use in the Swiss mountains! The ITT should also help their cause. As both men will still be pushing for Tour leadership this year, expect them to work well until the road goes uphill, at which point it will be every man for himself. The fact that Thibaut Pinot can now compete in the ITT is a huge bonus for him and the FDJ team. He has had a great year so far, winning the Critérium International, and going well at Volta Algarve and País Vasco. Another strong performance or even a win here will have the French media talking him up ahead of July — and he certainly has what it takes to score at least a podium in the high mountains. 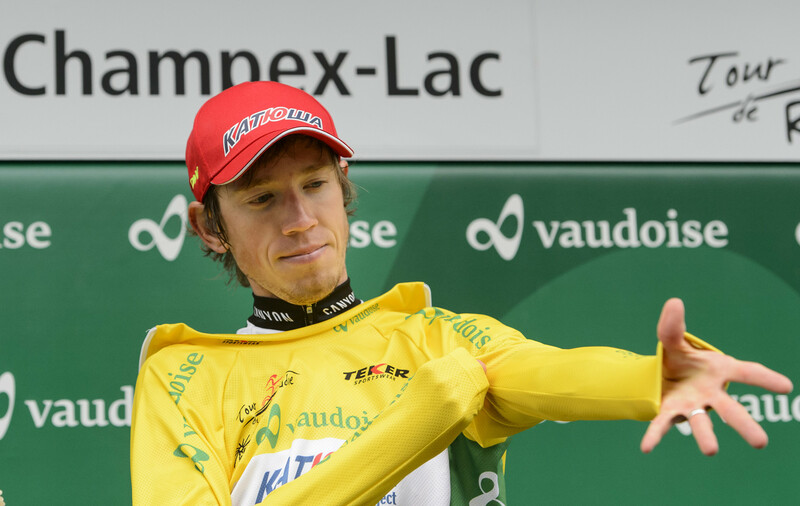 Last year’s champion Ilnur Zakarin is in fine form, and he’s certainly in a position to defend his title. A strong Paris-Nice (in which he won the Queen Stage) and Catalunya were topped off by a 5th at last weekend’s Liège-Bastogne-Liège. He won’t give up his title without a fight. His teammate Simon Spilak has a hugely impressive record at this race (1st in ’10, 2nd in ’13, ’14, ’15); however, we think that, given the field this year, 2016 might be a year he fails to even make it into the top ten. This will be the last time before the Tour that Nairo Quintana and Chris Froome race against each one another, so this will be an important few days for the Columbian to show that he can get one over on the defending champ. The steep climbs and potential bad weather are his kind of racing, and he must be the favourite for the overall after narrowly missing out on taking the G.C. at País Vasco. On paper, Geraint Thomas is having a better 2016 than his leader Chris Froome, who is racing less this year and had a poor Catalunya against the main rivals. Froome also crashed in LBL last weekend, though looks to be okay. This will be a key week for Froome to show that that was just a blip and not a steady decline in form. Thomas will be more than capable of taking the lead if Froome falters, having shown his skill with a huge win in Paris-Nice. If they are both on top form, then don’t be surprised to see them both make the podium. Rafal Majka has had an unspectacular 2016 so far, and, with him focusing on next month’s Giro, he needs to turn up here in some kind of form if he’s going be on track to challenge for the pink jersey. We know he can perform well in the mountainous terrain, but until we see him riding we wont know what he’ll be capable off, especially after he, like Froome, hit the deck in LBL. Cannondale come with an interesting squad, with dual leaders in Rigoberto Uran and Andrew Talanksy. Uran is targeting the Giro, so should be reaching a peak in form. Talansky has, apart from a shock win in the Critérium du Dauphiné in 2014, generally failed to deliver, and, with riders like Davide Formolo and Joe Dombroski on the squad, we think he could get left behind and it might be the young guns that take over the G.C. charge if Uran is not up for it. Other good outsiders for the G.C. would be the in-form Rui Costa, Louis Meintjes, David López, Rafael Valls, Tom Dumoulin, Wilco Kelderman, Bauke Mollema, and Ryder Hesjedal. Phew. How apt that we have a race against the clock in the home of one of the biggest Swiss watch manufacturers, Tag Heuer. At just under 4km, there will be little splitting the top times. We last had a prologue, a little longer than this at 5.75km, back in 2014, and then it was mixture of sprinters and powerful classics/TT men that dominated the Top 10, with Michal Kwiatkowski, Rohan Dennis, and Marcel Kittel taking the the podium positions. Kwiatkowski and Kittel are here again, and both have shown good form of late –although Michal is coming off a fairly disappointing Ardennes week. It’s no surprise that Tom Dumoulin is one of the favourite for this. He was 2nd to Matthews in the Paris-Nice prologue, and he has quietly gone about his business in the early seasons, with no stand out performances but riding well. He’s slowly building up to next month’s Giro, so we should see him reach a peak in form this week. Geraint Thomas was 7th in the Paris-Nice prologue and went on to win the race overall. With him being lighter as a result of being more G.C. focused, he may lack the power to challenge over this shorter distance. Ion Izagirre also had a fantastic Paris-Nice (he also finished 5th in the prologue) and is one to watch. Jérôme Coppel crashed at Amstel Gold, so we’re unsure of his form and fitness coming into this race, but on a normal day he should be up there challenging. Riders like Jack Bobridge, Lieuwe Westra, and Cameron Myer could also go well here. The TT revelations of 2016 have been the FDJ team, with their focus on training for this discipline paying dividends, but this may be too short a distance for the likes of Thibaut Pinot and Alexandre Geniez, as well as for the other TT-skilled G.C. riders (Froome, Porte, Van Garderen, Quintana). We have three cat 3 and a cat 2 to start the racing off, which makes this stage anything but a ‘straightforward’ sprinters stage. The main climb of the day is the 2nd category Col des Etroits, which won’t have much significance in the final apart from sapping energy, as it comes at around 40km into the stage. We then come into a very lumpy final half of the stage with the ascent to Arrisoules at 90.5km, Surpierre at 116.1km, and Vauderens at 145km. After the final categorised climb there is a rolling section before the course drops down with 5km to go. As soon as the cat 3 climbs start it will make it tricky for the peloton to keep control of any breakaways and we could see a lot of attacks in this final section of racing. There are arguably only five teams with sprint interests (EQS, Kittel; Lampre, Cimolai; Sky, Swift; Trek, Bonifazio; LottoNL-Jumbo, Hofland). On paper this should end in a sprint, and if it does then Marcel Kittel will win it by a bike length or more and the other riders mentioned will fight it out for the remaining Top 5 spots. We think late attacks/breakaways could also have a shot today. Last year, Albasini, Costa, Caruso and Pantano went well in lumpy stages that ended in sprints, with Albasini winning both, but there was a lack of pure sprinters in the field. I wouldn’t be surprised if these riders went for a late attack on the final descent with 5km to go. Albasini and Costa are in particularly good form after the Ardennes and will want to continue it — our money would go on one of them. Riders like Jan Bakelants and Ramunas Navardauskas could also spring a surprise with a late attack. This stage is all about the final 50kms. 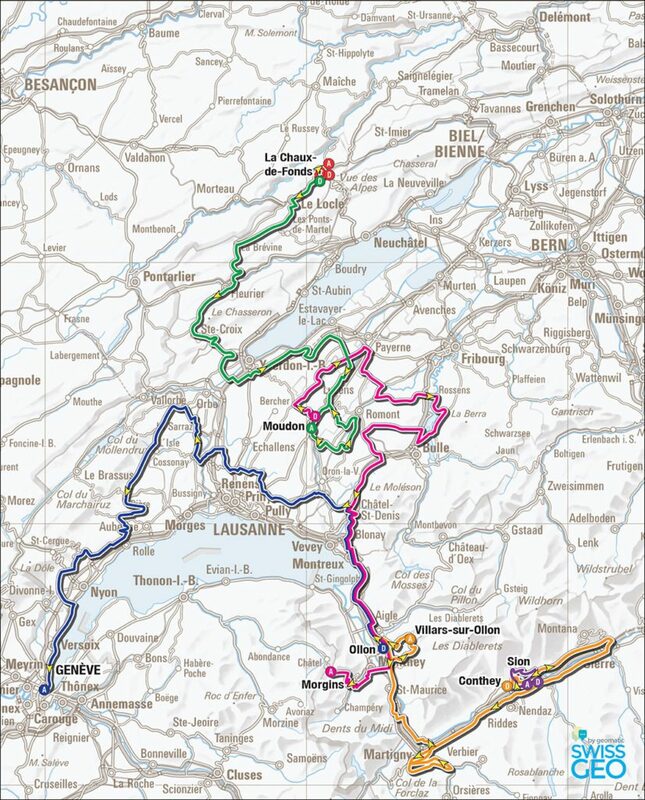 At 120kms, the race passes through Monteux on the banks of Lake Geneva, and if the wind is up then this exposed section could produce some opportunistic cross-wind gaps in the run-in to the final two climbs. In the last 22km the climbing is pretty relentless, with the Cat 2 climb to Les Champs and the Cat 1 summit finish to Morgins, which is 6km long at 5.6%, and which will make for a tough uphill finish. This stage should be about the G.C. contenders, so we’d be looking to the Sky duo of Froome/Thomas, BMC’s Porte/Van Garderen, Movistar’s Quintana, FDJ’s Pinot, AG2R’s Bardet, Katusha’s Zakarin and Tinkof’s Majka. These names should be the ones battling it out for the top 10, but they will also be challenged by Trek’s Mollema, Astana’s López, Lotto’s Valls, Lampre’s Costa, and whomever Cannondale decide to favor out of Uran and Talanksy. This should give an idea of who’s on form prior to the stage 4 Queen Stage. Breakaway and solo attacks could come from Rolland/Formolo, Myer, Meintjes, Arredondo and Westra (who won a stage in the 2014 Dauphiné that featured today’s final climb), all of whom might fancy the Gruyere points on a day like today. This is basically a pumped up version of the prologue, with a similar profile. It’s 15kms with another short climb, but it tops out at 10%. The same prologue protagonists will be in contention again, and the G.C. minded riders will be looking to build some time gaps between themselves and their rivals before the Queen stage. To go well in this stage, climbing and TT skills are needed in equal measure. This means the likes of Thomas, Froome, Quintana, Pinot, Porte and Van Garderen will be favourites here. 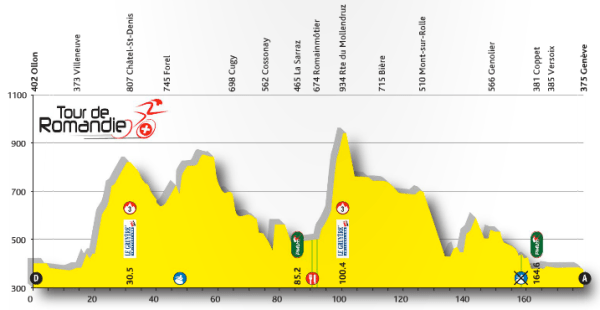 But, as the climb isn’t too severe, the powerful riders such as Dumoulin and Coppel will also have a chance. The Dutchmen will especially be looking to get as much time as possible here before the race heads to the stage 4 Queen stage. We like Cameron Myer and Alexandre Geniez as outsiders for this. The Queen stage, and the site where the G.C. will be decided. We’ll have an idea by now of who’s in form, and the winner will need to be today — with over 3,000m of climbing to tackle in the form of three category 1 climbs and a some cat 3s for good measure. There’s also a risk of snow on the summits, which could make a gruelling day into a miserable one. After a 70km leg-loosener, we reach the Col des Planches, which, at 11.4 kilometres at 8.2%, it the highest point of the day. Then the riders face the final climb to Villars-sur-Ollon (5km long and 5.3%), but they’ll ride it twice. It’s an irregular climb, with the middle section really piling on the hurt, and it’s here that we’ll see riders fall behind. They first tackle it after 120km of riding, where the descent down Ollon could provide the able descenders or any escapees a chance to break away from the remaining group, and then at 165km with this final ascent deciding the winner of the stage — and most likely the race. Simon Spilak and Chris Froome duked it out on this climb back in 2014, with the Slovak the victor.The same contenders of Stage 2 will be the ones to watch again here, but expect the G.C. teams and riders to dominate as they look to reinforce their overall placing. Unlike last year’s final stage which was a ITT, this year’s race ends with another break friendly/sprinter stage. However, unlike Stage 1, this looks more likely to end in a bunch sprint. The terrain is constantly rolling, from 18kms into the stage until the race reaches the final 10kms. There are some exposed roads earlier on as the race curls round Lake Geneva, so a breakaway could form here in the wind, but there will be ample time for the peloton to pull them back. With the G.C. likely decided it will be up to the sprinters’ teams to control the race, and this will all depend on how their main men have handled the previous day, and if the legs are up for the challenge after hauling themselves over the mountains. Again, on paper Marcel Kittel is the fastest, but we’re not sure how well he’ll fare in the mountains. Maybe someone like Ben Swift, Micheal Albasini or Niccolo Bonifazio could steal the day if the German isn’t up for it. Adam Blythe could also go for the sprint, as a dark horse for Tinkoff. Chris is going with the ultra-motivated Ilnur Zakarin. His form at the moment is extraordinary, and he’ll have been gearing his season around this tour. After his massive mountaintop win in Paris-Nice, and a fifth in Liège-Bastogne-Liège in terrible conditions, you can bet that Zakarin’s up for the challenge of Romandie. James picks Thibaut Pinot. Reborn as a G.C. rider who can climb, and now with a time trial to be proud of, and he’s put those descending demons to bed. This could be the first big step of a big few months for him. He needs a strong showing here for him to be seen as genuine contender for Le Tour, and not just as a French outsider. A win against this field would do that very nicely! Andy picks Tejay Van Garderen. It’s been mixed blessings for Tejay, but he’s always up there amongst the best in the mountains, and he’s got the time trial skills to lay down a challenge to the other G.C. riders. Go Tejay!